When Mitsukuni, grandson of Tokugawa Ieyasu returned to his domain Mito from Edo where he lived, he visited a residence of one of his vassals and took a rest in a bower, the name of which was Tokugetsu-tei. On this historical site, banker Jin Kameyama (1885-1974) built a tea house in 1949, and invited Tokugawa Kuniyuki（1886-1969）, the 13th head of Mito Tokugawa family and former prince to the place. Kuniyuki presented Kameyama calligraphy of two big letters “Toku-getsu” he wrote himself for the tablet to be displayed at the tea house. 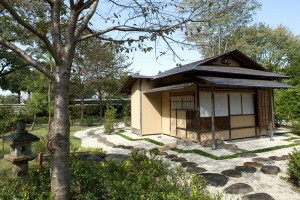 The tea house “Tokugetsu-tei” was donated to the foundation by the family of the late Mr. Toshihiko Kameyama who long served as a director of the foundation. Please enjoy the traditional “Sukiya” architecture tea house and the tea garden designed by Masao Yoshida.